This November, voters in Charlevoix Township will vote on a $1.8 million bond proposal. It would be about $92 for $100,000 in taxable property in the first year and take 15 years to pay off. If approved, it would mean firefighters get a new station on the north side of town. 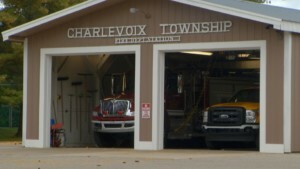 “I just hope everyone will be in favor of this, it’s long overdue,” Charlevoix Twp. Trustee and Assistant Fire Chief Dave Christiansen, said. Built in the 70’s not much has changed about the north side building, well except the roof leaks a little more. “A lot more leaks in the roof now,” Dave, added. Christiansen has been here since 1973. “We really don’t have an adequate training place, we don’t really have a meeting room, a very small office we just don’t have space for our equipment,” he explained. There’s no room, nor are there any drains. “When we come back from a fire we have to wash everything outside,” Dave, said. “Negative 28 degree wind-chill and we are out here and soap freezes faster than you can rinse it off. You got to do what you got to do to take care of your stuff,” Firefighter Dan Riley, said. “At this point we’ve never had indoor plumbing at our station,” Dave, added. Its been over 35 years that this is all we’ve had for a bathroom. This is our only facilty,” Dave, explained, pointing to a port-a-john outside the station. For a team of mostly volunteers, risking their lives to help others. “It’s hard to get new people when they say you don’t even have an indoor restroom in the place and I say, well, no, we don’t,” Dave, added. They’re hoping a “Yes” vote on November 6th will change that. “It will definitely give us a bigger sense of pride in what we have. Support your local firefighters, they’re taking care of you and let’s get a chance to take care of them,” Riley, added.